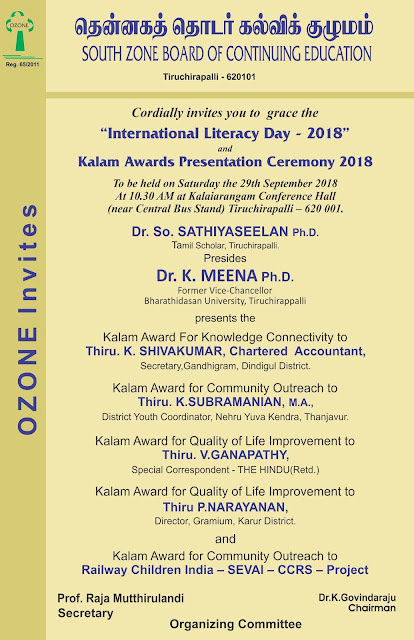 South Zone Board of Continuing Education (OZONE), an inspired arm of Tamilnadu Board of Continuing Education (TNBCE) celebrates World Literacy Day on 29th Sep.2018 at Trichy, Kalaiarangam Conference Hall on 29th Sep.2018. On this occasion a seminar is organized on the theme of Literacy and Skill Development. OZONE has instituted Awards in the name of Dr.A.P.J.Abdul Kalam. The awards for the year 2018 will be presented to dignitaries on 29th September by then Vice Chancellor of BU. The Secretary,Gandhigram Shri.K.Sivakumar will be presented Kalam Knowledge Connectivity Award. Awards also presented to other renowned social activists also.